Tom Givens and Ron Givens since 1983. We specialize in all automotive and light truck vehicles. Our capabilities include diesel diagnostics and repair, electrical diagnostics and repair, and all gasoline engine diagnostics and repairs. We are open Monday – Friday 7:30am to 5:00pm, and Saturday 7:30am – 11:00am. We are closed on Sunday and we observe most holidays throughout the year. Please call to confirm. Our technicians are ASE certified. We use NAPA OE replacement parts and all work performed is warrantied nationwide with over 15,000 facilities within the NAPA Autocare family. 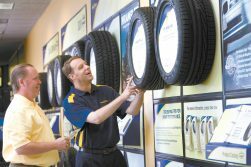 We enjoy the recognition of being a Michelin Authorized dealer and NAPA Autocare repair center. We inventory tires from all manufacturers such as Michelin, Bridgestone, Uniroyal, Goodyear, Firestone, Falken, Nexen, Dunlop, Kelly Springfield, and many others. We offer the Napa EasyPay credit card which is honored nationwide, has 6 months financing with no interest and may be used at select fueling stations throughout the entire country. We look forward to helping you with your auto care needs. Our motto has always been…‘if it’s not right, we’ll make it right’.